On a spring day a few years ago Colin and I found ourselves in the south-west of Mull, and took a drive down the road that winds its way from Pennyghael across some lonely stretches of moorland before dipping down quite steeply towards Carsaig. 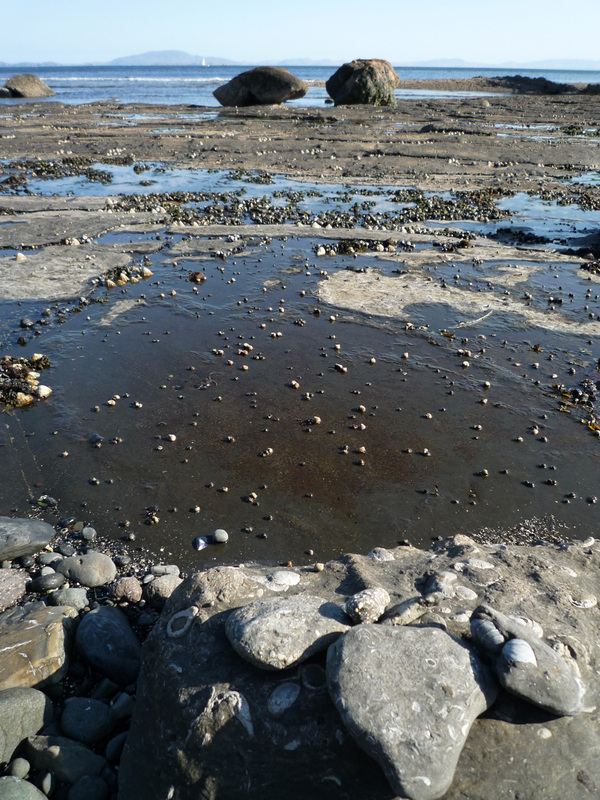 From the car park we headed eastwards along the shore – it was not the easiest of walks, being boggy in places – and found ourselves on a beach that was strewn with huge rounded boulders, the kind that giants would use to play marbles. 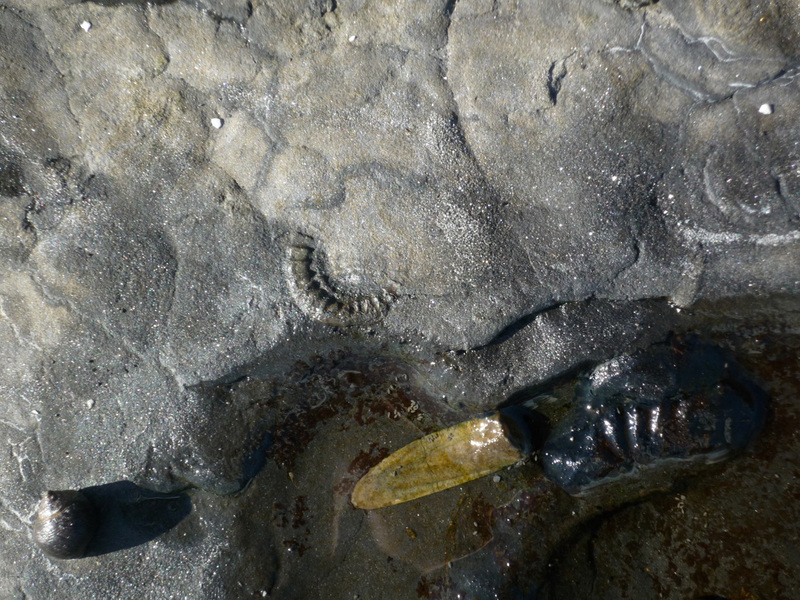 Stretching away from the boulder fields, down into the sea itself, were flat beds of shale, pitted here and there with shallow pools… and, to my delight, I found that they were teeming with fossils. Being the kind of person that gets excited over just one fossil, you can imagine how I felt at seeing many hundreds, all jumbled together as if their Cretaceous cocktail party had come to a premature end. 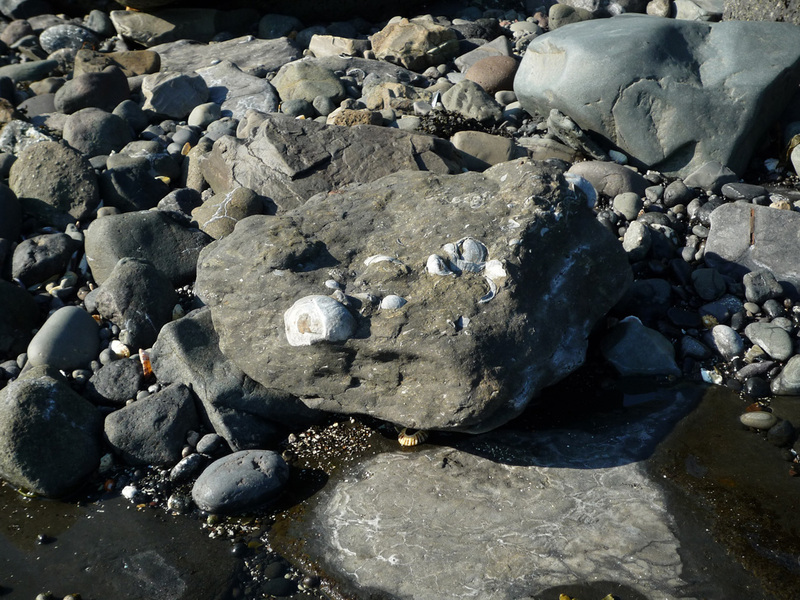 To add to the delight, living molluscs – limpets, periwinkles and barnacles – had colonised the same surfaces, carrying on their daily cycles of feeding and shutting, right next to the remains of their distant ancestors. 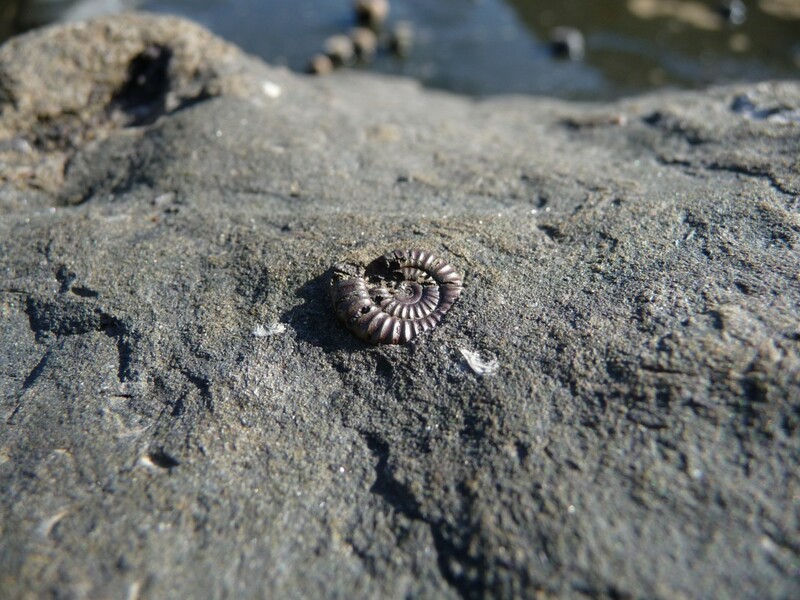 Among the fossils that you can find at Carsaig are ammonites, belemnites, and the aptly-named devil’s toenails or Gryphaea. I managed to find several examples of ammonites and Gryphaea, but it was only when I looked again at my photos that I saw what I thought might be belemnites. These are bullet-shaped crustaceans, believed to be the ancestors of squid, but with hard internal skeletons. 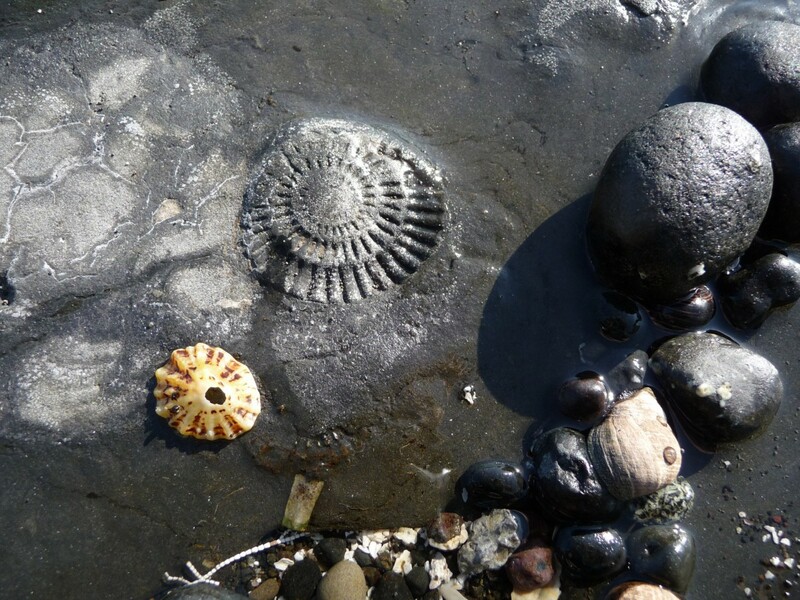 Ammonites were found in the Jurassic seas when dinosaurs roamed the land. 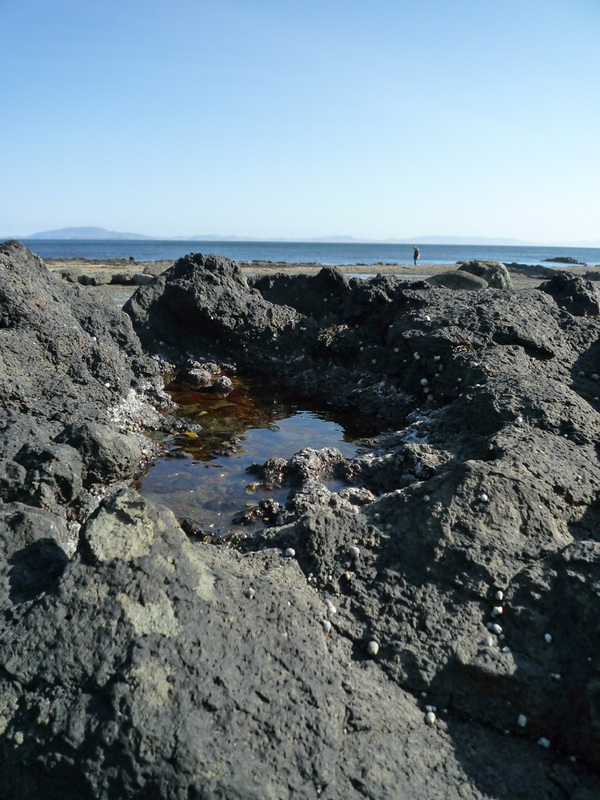 Where the actual fossil remains have been washed away, the casts often remain. The Hebrides had drifted 30 to 40 degrees north of the Equator. Plant and animal life flourished. 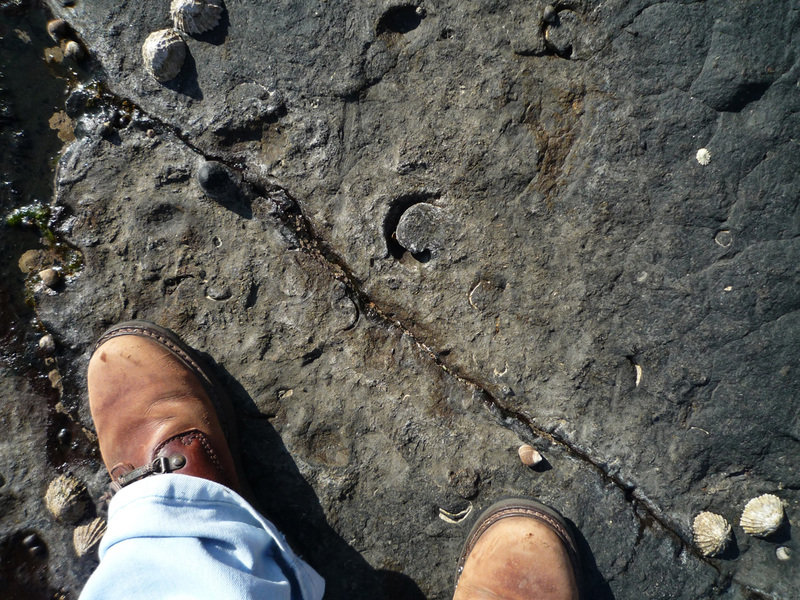 Sedimentation in shallow seas, and an abundance of ‘shelly’ fossils. Warm shallow seas widespread across most of NW Europe. Marine sands and chalk were deposited. 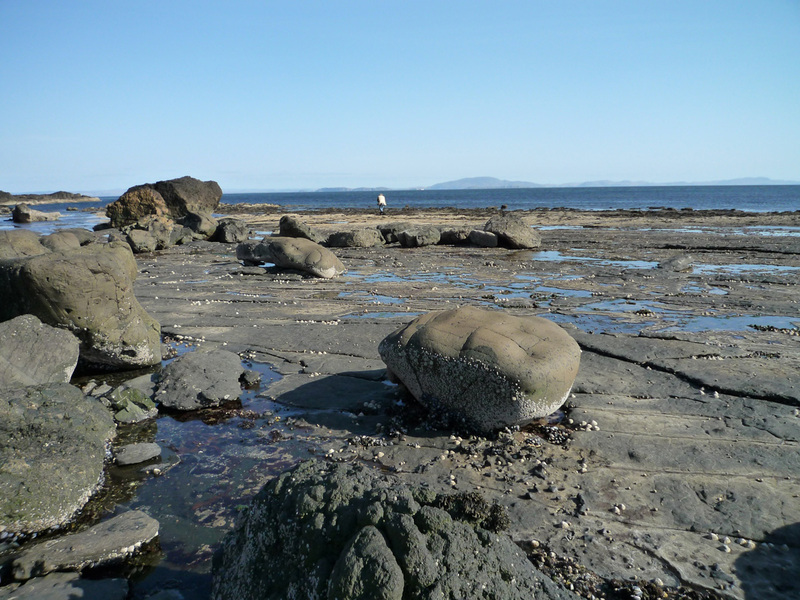 Gentle folding, uplift and erosion may have created a lowland landscape around the Hebrides at about 45 degrees north. Carsaig is backed by cliffs of basaltic lava which formed over 60 million years ago in a thick layer on top of the sedimentary rock. The sea has simply eaten it away, exposing a fossil-rich surface beneath. 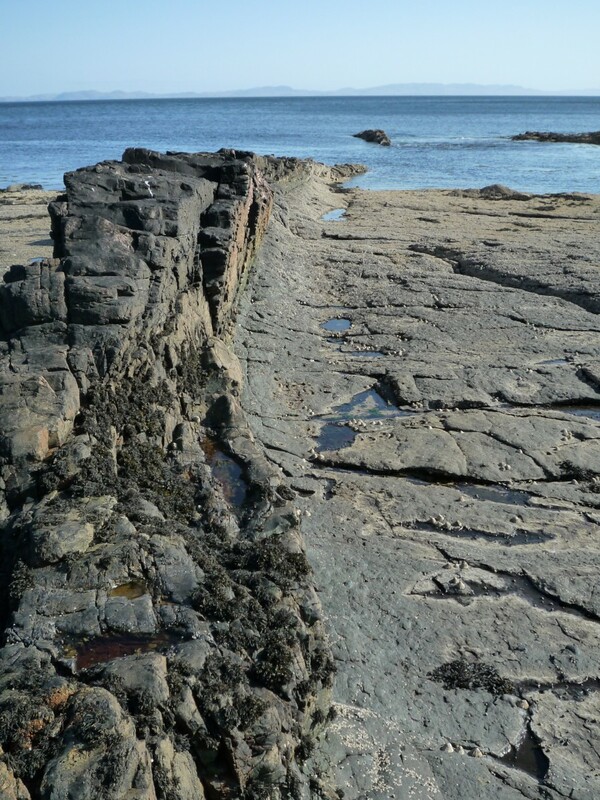 At one point the shore is bisected by a long, spine-like feature called a dyke – a vertical layer of igneous rock which formed when molten material seeped into a fissure in the earth’s surface. 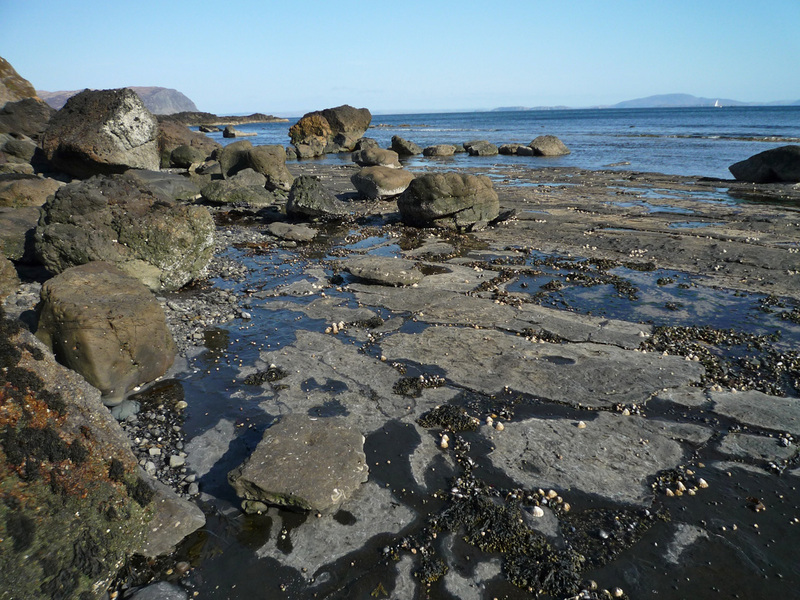 This is harder than the surrounding shale, and is taking longer for the sea to erode. 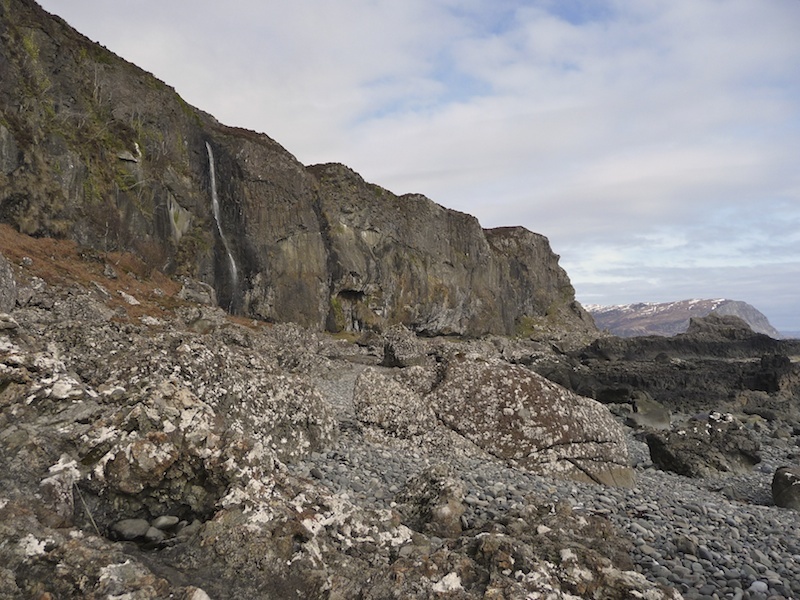 Further along from Carsaig are some impressive coastal arches, while on the remote cliffs of the Burg in the west of Mull is a fossilised tree trunk known as MacCulloch’s tree. Both of these sites demand a long and strenuous walk. 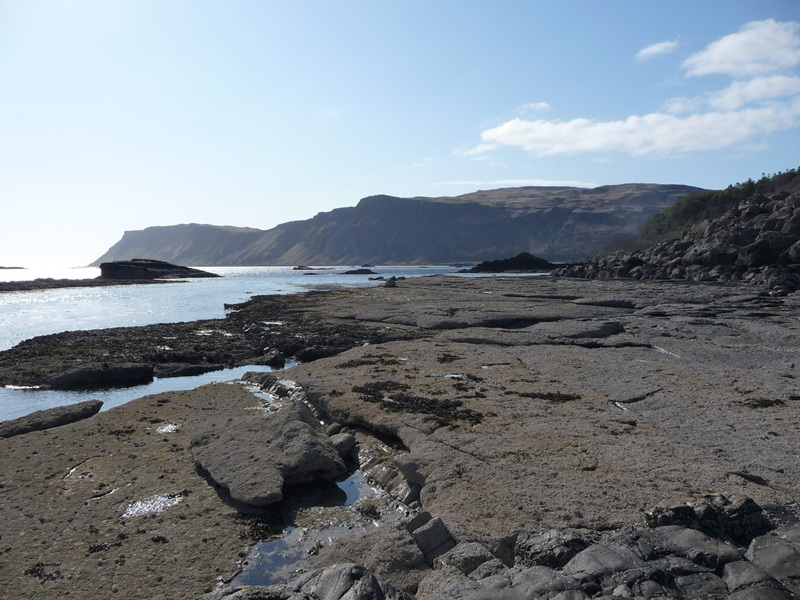 Mull is also known for its stepped ‘trap landscape’ around west-facing coasts, created by the erosion of lava layers. 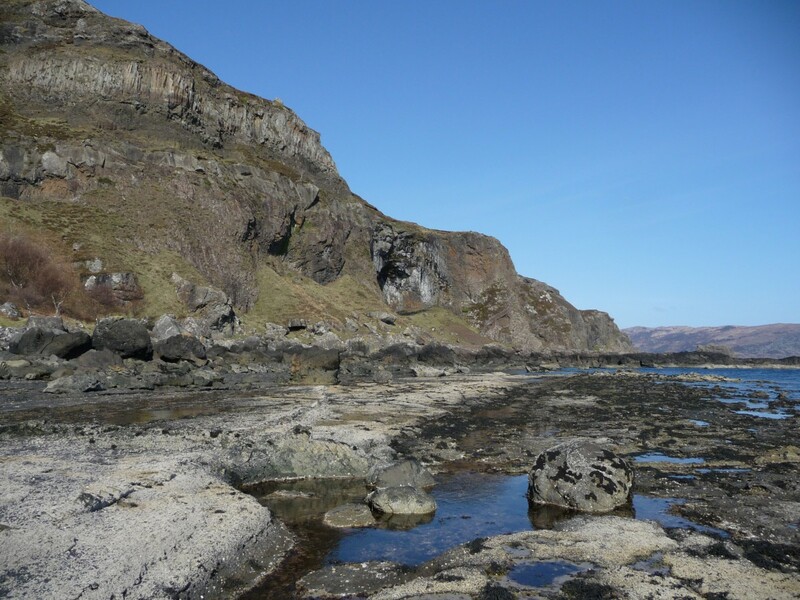 In this video by Isle of Mull Cottages, geologist James Westland talks about the landscape of Carsaig Bay and other sites on the island. If you’re planning a holiday on Mull, take a look at the wide selection of self-catering accommodation offered by Isle of Mull Cottages. The property shown here is called Dobhran Croft, a beautifully renovated croft cottage by Lochbuie. Love this article Jo. Superb descriptions and absolutely stunning photos. Must try and visit there sometime. Thank you very much, Moira! It’s certainly worth visiting this part of Mull – but then again, the other parts are so beautiful, too! My favourite island. You found a treasure trove there! The photos did justice. Thanks! Schhhh….don’t tell anyone. Magic spot. Thank you for this interesting post. I was at Carsaig in June and passed a couple who were returning to their car. I asked them how their walk was and they mentioned that they’d been looking for fossils. 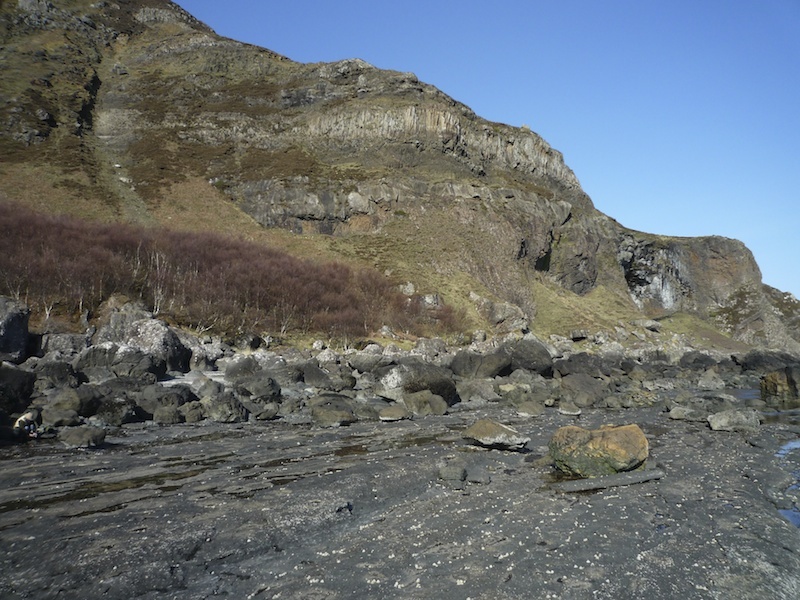 I’ve been to Carsaig a number of times (because of its role in the film “I Know Where I’m Going!”) but I’d never known that there were fossils there. 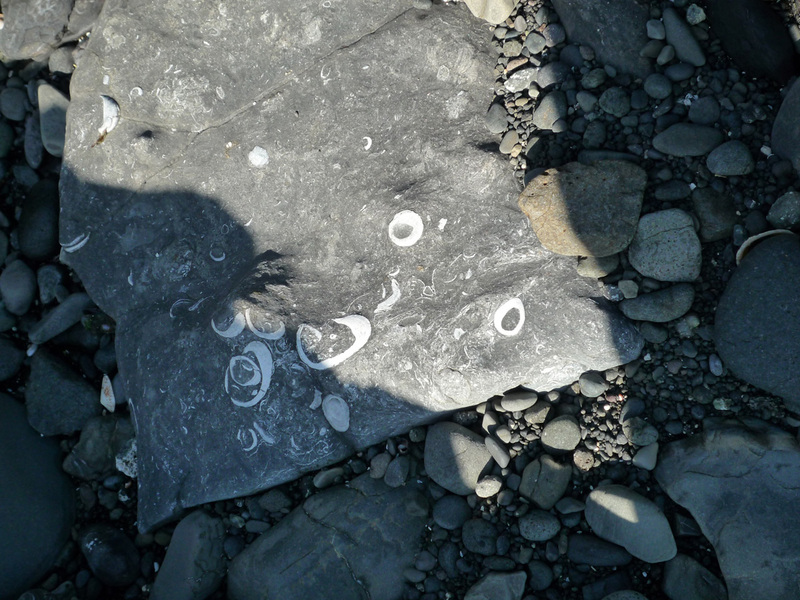 Sure enough, when I went on my walk I found a marvelous rock with many brachiopod impressions in it. 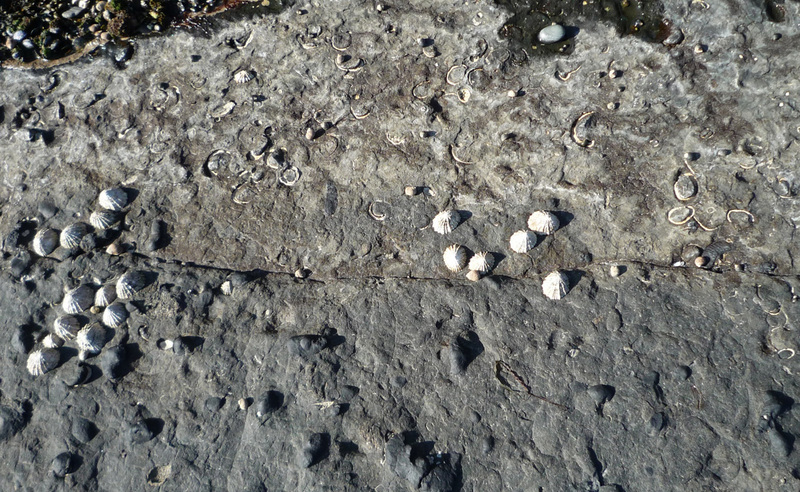 How do I know they were brachipods? Well, I sent a photograph to the Head of the School of Geological and Earth Science. at the University of Glasgow (thank you, Google search! ), Maggie Cusack, and she wrote back, “You have some nice brachiopods there so indicating a marine environment.Brachiopods first appeared about 550 million years ago and they still occur in all of the world’s oceans but they are now much less abundant than molluscs.” I would love to post a picture but there doesn’t seem to be a way to do that. Hi Nancy, lovely to hear about your trip to Carsaig! Yes, you’re right – I’d forgotten about that film! I’m so glad that you found some fossils. I know how exciting it is! 🙂 Brachiopods – I don’t think I saw any of these, although at the time I didn’t photograph everything. I’ve often thought that it would be good for WordPress to include an option for people to post pics in comments. You can always share a pic on my Facebook page if you’d like (scroll down for link). I can imagine your delight on discovering all those fossils. Your photo of the ammonite gave me a little thrill of excitement because it’s such a recognisable one. Mull has so much to offer, hasn’t it? A great place for a holiday, especially if you get weather like you had in these lovely pictures. It was such fun, Lorna! That little ammonite is really only about the size of a finger nail. I love Mull and it’s been too long since we were there. Every part of it is beautiful. Thanks Jo – another very beautiful place to add to the ever-growing must-visit list! Love the fossil photos and the beautiful ‘dyke’ geological feature. I really must give up work and take to travelling to all these places full-time (if only!) as I think that may be the only way I get to complete the list! I think you’ve got just the right idea! 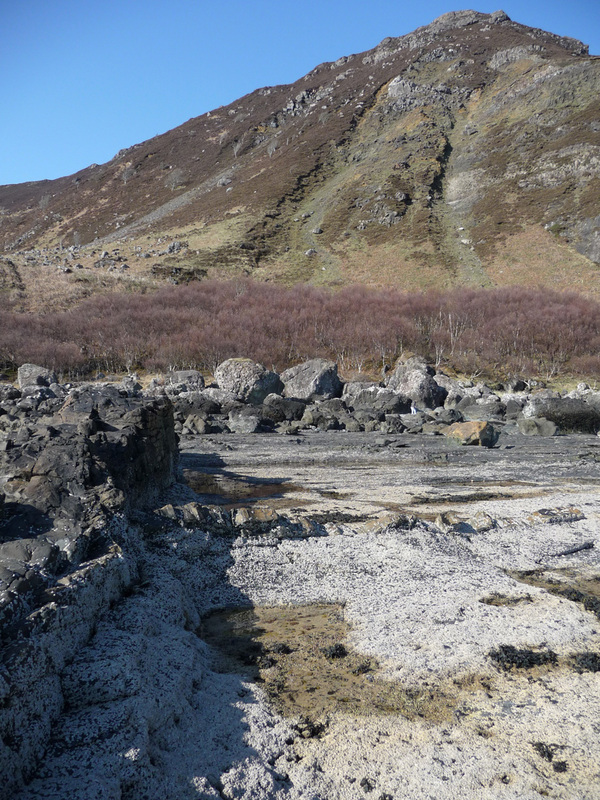 There is so much to see, just on Mull alone – wildlife, history, geology. Each Scottish island would need at least 3 months! 🙂 Thanks for your lovely comment. Fantastic post Jo, very informative with some great photos. BTW that is a section of a belemnite in one of your photos, it is probably in the Liassic Formation of calcareous shales, approx 180-200 million years old. Thank you very much, Andy! You obviously know your geology! Excellent – I didn’t know I’d found a belemnite! 🙂 Now I want to go back and have another look for it! I often wish I knew more about the rocks I’m always picking up – what they are made of, and how they were formed. Yes, Mull is calling to us at the moment! I want to get on a ferry now! Wow!!! It’s so unusual to hear someone else say that they are fascinated about how various rocks form, that’s what got me into the subject many moons ago. Many folk, if they have an interest at all, just like looking for fossils or semi precious gemstones, not that there’s anything wrong with that, I hasten to add! 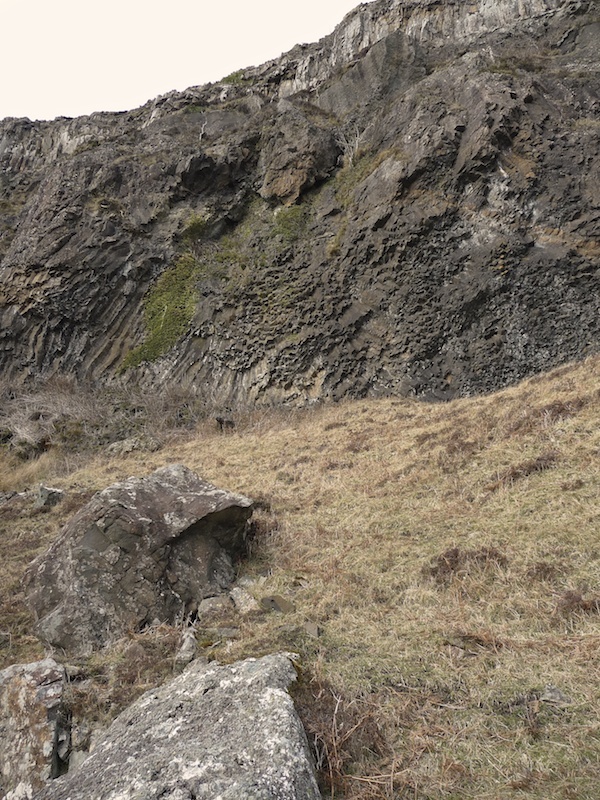 I have watched a few programmes by Iain Stewart and I admire the way he says he can ‘read’ a landscape in the way a geologist can – seeing folds and intrusions and being able to identify them and date them, and know what has caused this or that feature. I am still blown away by crystals and the fact that they form naturally within the earth. Part of me dislikes the fact that we dig them up at all, but I still can’t resist going into crystal shops! Gorgeous photos! Thank you so much for sharing. Most welcome, Louise, and thank you! It’s a truly beautiful place, one of Mull’s many hidden gems.